“We are happy to support the urgent work of the Institute, especially in this era when fewer media outlets will dedicate the resources needed to dig deeply and expose wrongdoing. Brandeis is just the right place for this Institute," Elaine Schuster told the Palm Beach Daily News. 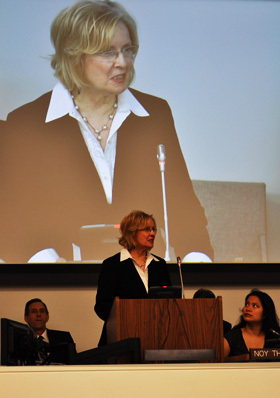 Institute Director Florence Graves at the United Nations, where the Schuster Institute cosponsored a panel with the U.S States Mission to the United Nations (USUN) and the UN Office of Drugs and Crime (UNODC). The June 16, 2010 panel discussion focused on how the news media have helped expose and explain modern slavery—and how to do better. Journalism is protected by the First Amendment to the U.S. Constitution for a single reason: an unfettered news media is essential for a healthy democracy. What you don’t know can hurt you—when it becomes bad medicine, dangerous products, unsafe or unfair working conditions, wrongful convictions, evaporated pensions, or skewed and harmful policies. Without oversight, human beings too often behave badly. When the facts are pursued with ruthless thoroughness, watchdog journalism helps keep American institutions accountable to all. Unfortunately, the upheaval in the news media means that fewer and fewer resources are available for serious investigative journalism. Newspapers have less to invest as they reel from the plummet in readership, a declining advertising base, and the ever-multiplying sources of information and entertainment. New information and media outlets, however, rarely have the resources to invest in expensive, in-depth investigations whose outcomes are uncertain. As a result, far too many talented and dedicated investigative reporters have either been let go or are working with dramatically reduced resources and against great odds. The Schuster Institute for Investigative Journalism, the nation’s first investigative reporting center based at a university, was launched in September 2004 to help fill this void in high-quality public interest and investigative journalism. As one of the pioneers in the new nonprofit journalism, our goals are to investigate significant social and political problems and human rights issues, and uncover corporate and government abuses of power. The Institute is one of only a handful of independent reporting centers in the United States focused on national and international issues—and the only one whose central focus is social justice and human rights. In the muckraking tradition of Ida Tarbell and Nellie Bly, we focus particularly on speaking on behalf of those who might otherwise go unheard. By being housed within a university, the Institute is firmly placed within an academic tradition that honors freedom of inquiry—and that offers independence from the government influence and corporate control that too often undercut today’s media. Brandeis University, with its longstanding dedication to social justice, human rights, and the pursuit of truth wherever that might lead, is an ideal host. 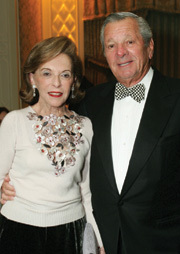 The Schuster Institute for Investigative Journalism is named for philanthropists Elaine and Gerald Schuster, our visionary primary funders. Support for our Justice Brandeis Innocence Project and our Ethics & Justice Fellowships comes from the Ethics & Excellence in Journalism Foundation. We have received grants from the Blaustein Foundation and donations from individuals. Let me add a personal note. Much of my journalism career has been devoted to stories that required an enormous amount of time, resources, and editorial commitment: breaking the Sen. Packwood sexual misconduct story with The Washington Post; revealing Pentagon contractors’ gross misuse of funds and the U.S. Food and Drug Administration’s highly questionable approval of the artificial sweetner Nutrasweet in Common Cause Magazine; or exposing Clinton accuser Kathleen Willey’s lack of credibility in The Nation. But today, in my experience, fewer and fewer news outlets are willing to make those investments in uncovering hidden wrongdoing. Ironically, at a time when we face a great deal of partisan noise and a blizzard of information that arrives via new technologies, real news and groundbreaking reporting are at a premium. Fewer serious media outlets are taking on truly urgent stories of public misconduct. And yet our democracy still desperately needs the news media to take up their constitutionally protected task, without fear or favor. Fortunately, I also know from personal experience that the focus, passion, and commitment of even a small group of determined people who care deeply about pursuing the truth and exposing social injustice can make an enormous difference. That’s why I felt compelled to launch this Institute. I hope you find this Institute’s work, including this website, to be valuable. We are eager to hear your thoughts and ideas—especially, of course, any tips you might have about important stories. Please stay in touch with us at schusterinstitute@brandeis.edu.